Star Wars: Less Filling, Tastes Great! Re: Star Wars: Less Filling, Tastes Great! Hey kid; after we finish off the roast Jar Jar head, make sure you have room for the Ewok fricassee! "No, we don't cut the roast beast with a lightsaber. What, ya never heard of tradition?" 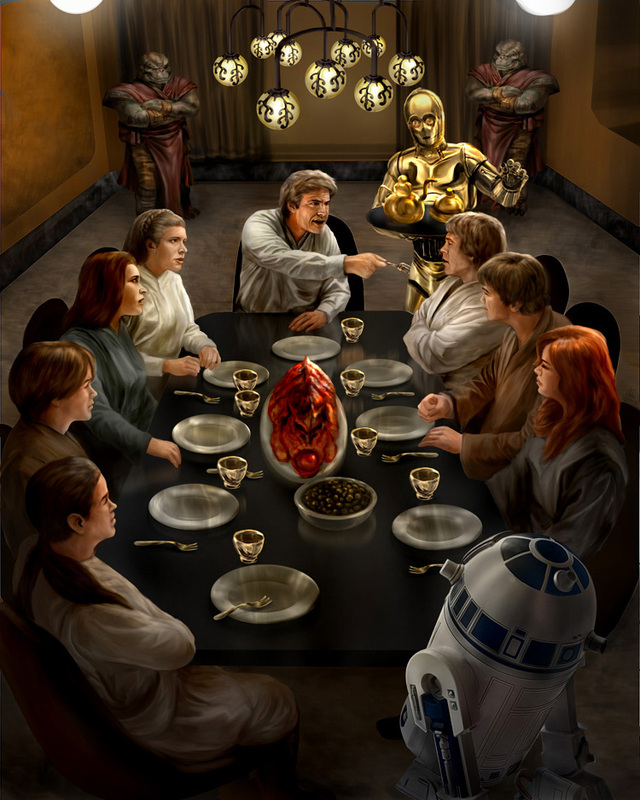 Take it, Luke... Obi Wan's last wish was that the fork be with you. Leia: Luke! There are children present! George Lucas' version of the Waltons. "And we sure as hell don't cut the cheese with one either, Luke!" Han: "Luke, you invited R2, you decide what we're going to feed him..."